Night in the Forest (80″x80″) is my interpretation of the 2012 Asheville Cotton Company’s Quilt Club project. Part of the learning and challenge for me on these projects is deciding how to assemble and finish the quilt once the individual blocks have been made. In this case, that decision was triggered by finding an engaging center panel that had almost the exact colors of the quilt club blocks. I loved the style of the panel art and all the fun elements and that dark background was perfect. I carefully planned how to use my ten club blocks around the edges of the panel and created four more for the corners. Making these extra blocks and the additional spacing elements needed to have the sizing work out provided a perfect opportunity to add in colors to blend the panel into the overall quilt design – namely the red and the natural white. Not only did the center panel inspired the rest of the design elements, it gave me a chance to practice my free motion quilting in a lot of detail. 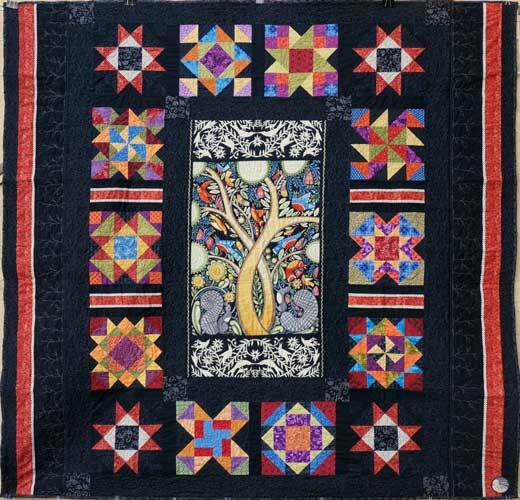 The blocks and fill areas also have free motion quilting designs, including the leaves/vines along the edges which were sewn with a higher contrast thread to they would stand out. The best part of this project was realizing part way through that it made me think of wonderful friends Brandy & Dave who had gotten married last year. And it was my great pleasure to gift them the completed quilt and find they loved it as much as I hoped they would. It makes me smile when a quilt finds its perfect home.